Jim does a lot of modifications on the garden tractors to get just what he wants out of them. Our shop tractor, ” The Bird ” was one of those many projects done. If you would like to read about all of the modifications to this John Deere 318 garden tractor we have a web site page that explains them all. Jim even put headlights in the front end loader bucket. The “Bird” has been featured in 3 different magazine articles. Q: I have a Cub Cadet Series 3000 (3165), that my dad left me. The 3000 series originally offered a front end loader as an attachment, but only on the 20 HP and above versions. 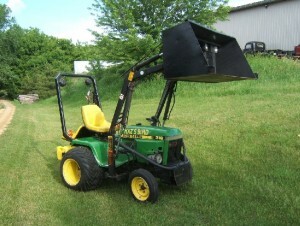 This 16 HP has a rugged enough frame for the job, can be fitted with a 3 point hitch, and has a 48â€ mower deck. I don’t want to buy a bigger tractor, this is just the right size. Is there any loader that will adapt to this machine? Would I have to repower up to a 23 HP Vanguard? A: If your engine is in average condition you will not have to worry about your 16 horsepower being too small to run a front end loader, that engine will easily handle the load. Q: OK Jim, You have my attention. The tractor is in very good shape so that’s not an issue. The questions that come to mind are: 1) Have you, or anyone ever attempted this combination before? 2) Will my axles stand the strain of the increased loads? 2 guys to lift and mounted it on the tractor, guessing the weight on that to be about 200 lbs. Then the loader empty weighs 400 lbs. You should easily be able to haul 600 lbs. in the loader. An average garden tractor will weigh 700 lbs., all adding up to 2968 lbs. And that’s not all, I put in a 23 horsepower Vanguard engine ahead of all this weight and then wonder why I break axles once in a while. No you do not have to do all of this to make a garden tractor and a front end loader work. I guess I just enjoyed doing the work of what a $30,000 tractor will do. If you are the type that likes to revamp and build things or know of someone like that to help you, when you get it all said and done it will be something to be very proud of and a very useful piece of equipment that will save your back and much more. Are you sure you have the correct part number ignition switch? Is the wiring in okay condition at the ignition switch?